In a lot of ways, unlikely presidential debate star Ken Bone is a marketer’s dream. He is undecided on his political leanings (for now), inoffensive, instantly recognizable, and affable on TV and social media. So it makes sense that Uber asked him to send a promotional tweet for this week’s launch of Uber’s black car uberSELECT service in St. Louis, site of the debate Sunday night that launched him to fame. The guidelines that Kurnit is referencing are pretty straightforward, and the FTC offers specific advice for how to craft sponsored posts on Twitter. Kurnit added that while the FTC “doesn’t like” using simple hashtags for disclosures, he agrees that it might have sufficed. “My own feeling is shame on Uber that they didn’t tell [Bone],” Kurnit said. VICE News reached out to Bone over Twitter and left a message on Bone’s grandmother’s voicemail. He did not immediately respond to our request for comment. An Uber representative did not immediately respond to an additional request for comment when asked about the tweet and FTC guidelines. FTC spokesman Mitchell Katz declined to comment on Bone’s tweet, citing the FTC’s policy against discussing any individual cases (whether ongoing or hypothetical). “If we take an action against a company or individual, we do issue a press release in every instance,” Katz said. 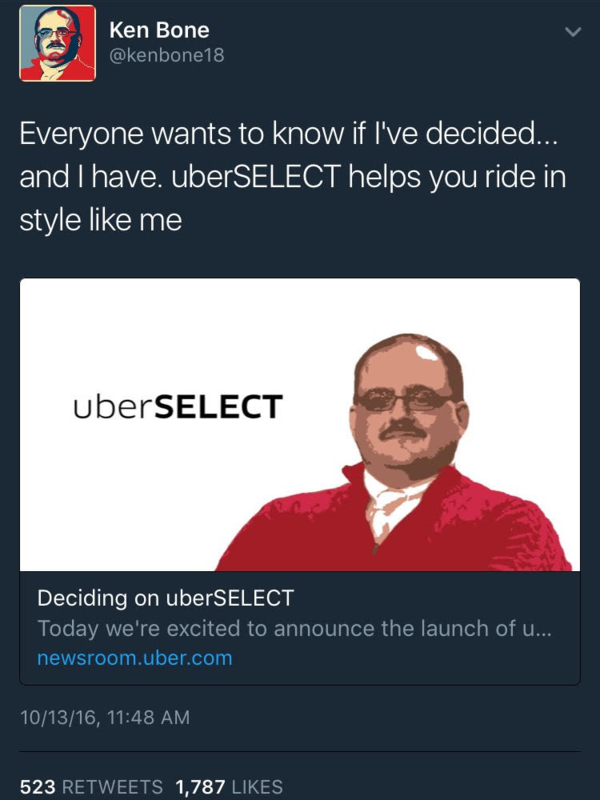 Update: A few hours after this article was published, Ken Bone deleted his promotional tweet for Uber and issued an apology.